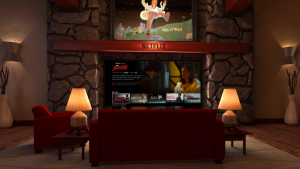 Netflix has become a hugely successful movie and TV watching platform, so when I heard they were coming out with a VR app, I was pretty intrigued, to say the least. I had no idea what they were going to do with it besides just watch your shows on a headset. 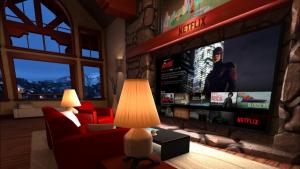 And yes, at its core this is you just sitting there watching your show on a headset, but Netflix decided to up the ante and immersion just enough to make the VR app stand out. Let’s take a closer look. It’s the incredible amount of details in the room that draw you into a completely wonderful experience. 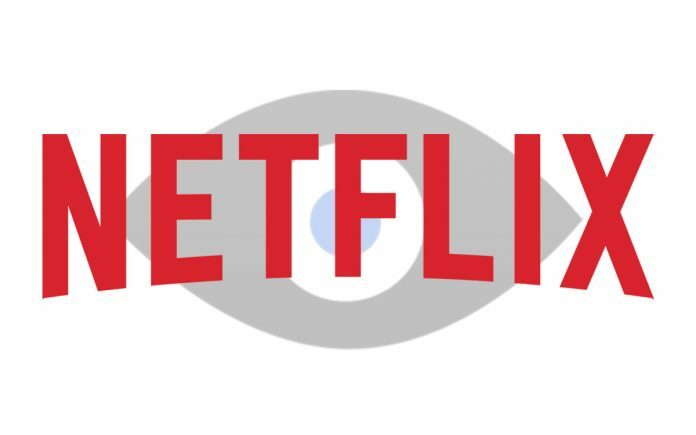 Once you log in with your Netflix credentials, you are transported to your own private log cabin up in the snowy mountains. You’ll find yourself sitting on a beautiful red leather couch surrounded by giant posters of popular Netflix shows hanging on the wall. In front of you is a large screen TV framed by some great stonework. 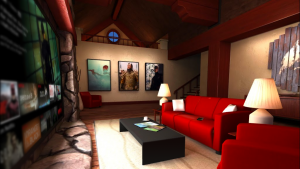 There are little details all around the room that add to the immersion, such as a coffee table in front of you with a few magazines spread out on it, a remote control on the couch next to you, a large chandelier above you, snow covered trees outside, and some vases on a table behind you. You scroll through shows and movies simply by looking at the screen and tapping what you want to play. 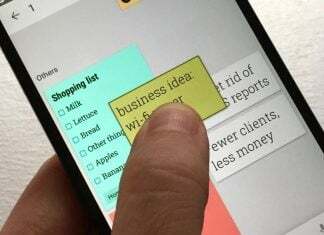 It’s super intuitive and easy to use. Once your show starts the lights dim, and the light from the TV dances around the room, reflecting gently off the objects around the room much as you would see if you were actually watching TV in the dark in a non-virtual room. I find the whole scene to be super cozy, which is what I’m sure they were going for, but if you are unimpressed or just want a straightforward approach, there is a “Void Theater” mode accessible by looking straight up and clicking on the link above you that will take you to a black environment with just the Netflix interface and your show. It’s efficient, and I’m sure there are quite a few that appreciate the simplicity of this or who may need it for a lower end device, but I found the charm of the whole cabin scene to be a fantastic part of the experience. Cozy doesn’t even begin to describe it. I decided to really give this app a spin while my wife was out of town for the night. She’s not a huge Bob’s Burgers fan, and I had only seen 3 or 4 episodes before, so when I fired up the VR and saw it on my “Watch It Again” list, I loaded it up and watched for about an hour and a half. As this was my first time really sitting down to watch something in VR, I was amazed at the image quality as I watched. Everything seemed really crisp and high quality. There were a few moments where I would reach over for the remote to find that, alas, I am in VR and had to adjust the volume with the device strapped to my face. It was at this point of losing myself that I had to both chuckle, and admit that the whole experience is super sophisticated and perfectly achieves what it’s going for, as I was so immersed in my virtual world that for a moment I forgot that I wasn’t actually there for a minute. This is a warning that comes with most VR setups, but you will want to take frequent breaks while watching shows. After watching for about an hour and a half, I took the headset off to find that my eyes felt some light strain, and focusing on far distances made my eyes feel off, since when you focus on distance objects in VR, you are really just focusing on things that are the same distance away as everything else. I know that Samsung’s Gear VR recommends breaks every half hour, and that advice is something I strongly urge you to follow. If you are planning on sitting down to watch a movie or something for an extended period of time, you are probably better off watching it on a regular screen rather than in the VR app. If you do want to watch it in VR, I highly suggest breaking up viewing into multiple segments. There have not been long-term studies done on the effects of VR on the eyes, so better safe than marathoning Orange is the New Black and suffering from eye damage. I was more than pleasantly surprised to discover how Netflix had taken their offerings and made the jump to the virtual landscape. The cozy cabin they put you in draws you in with an incredible attention to detail, and everything you watch is beautifully displayed on a huge “screen” in front of you. It even caters to the crowd who wants no frills, just a basic viewing experience. While extended viewing sessions are not recommended, if you are looking to watch an episode or so of your favorite show, there are worse ways to do it than to curl up on this virtual couch and be transported to the house that Netflix built.